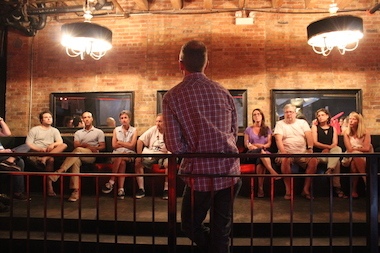 Jeff Keirns, co-executive producer for "The Real World," speaks to West Loop residents Monday at 1100 W. Randolph St. The building is the former site of nightclub Bon V, which production company Bunim/Murray hopes to convert into a home for the show. WEST LOOP — No funny business. That's the message West Loop residents delivered to representative of MTV's "The Real World" at a meeting this week, as the show's producers wait on a final zoning change that would allow them to begin construction and filming in the neighborhood. Last week, sources confirmed that "Real World" producers Bunim/Murray Productions were considering a two-story former nightclub at 1100 W. Randolph St. for yet another episode of the reality show, now in its 30th season. Bunim/Murray will go before the Zoning Board of Appeals on Friday to request a permit that would allow the building to be transformed into a "seven-bed temporary group living residence." At a community meeting Monday, about 14 residents met with one of the show's producers and representatives from the city to voice concerns about the potential "Real World" taping. Several residents brought up the last time the show was filmed in Chicago, in Wicker Park in 2001. During that taping, a group of neighborhood protestors picketed outside the loft at 1934 W. North Ave., accusing the show's producers of causing further gentrification in the area. Greg Shapps, 44, lived across the street from the Wicker Park action at the time Real World was filming. "It was a real pain in the a--, I've got to be honest. There were a lot of idiots out there. People throwing paint all over each other, people try to start fights because they wanted to get on camera. There were a lot of shenanigans," said Shapps, who now lives around the corner from the proposed West Loop "Real World" location. "Real World" Co-Executive Producer Jeff Keirns acknowledged that while the show's cast members will be monitored 24 hours a day, he can only do so much to anticipate how the public will react to the filming. "When it comes down to the public coming to the building and doing things and throwing paint, etc., etc., I can't stop that. And that's one of the reasons we really don't like to advertise where we are," Keirns said. Others — like Stephanie Ranieri of Montessori Academy of Chicago — brought up the schoolchildren in the area, who Ranieri said often walk down Randolph Street. "How could you go about not getting them on camera?" Ranieri said. Keirns said that his crew will do its best to avoid taping around minors. He also stressed that the cast can't just wander anywhere they like — all members have to check in with a producer before leaving the property. While there is an outside patio planned for the building, Keirns said producers also plan to block off that area from public viewing via a fence and hedges. Additionally, there will be 24-hour security and spectators will be discouraged from hanging out around the property. If given the go-ahead Friday, Keirns said the show would take over the building in July and shoot over 12 weeks. Donnie Madia — who owns Blackbird, Avec and Publican Quality Meats — said if the "Real World" crew can promise to be "on point" through this process, then they have his support. "All we want is honesty and transparency," Madia said. "If everyone can conduct themselves like adults and there's no shenanigans and no bull----, then I think I can get everyone on board here." The show's producers go before the zoning board at a meeting at 9 a.m. Friday at City Hall, 121 N. LaSalle St., Room 200.